Bouncing Boots  are made for Veganline.com in British working conditions. Scroll down for other stock at slightly lower prices. Boots like this are vegans' best-kept secret: bouncier, & truer to your roots than the leather brands. The brown material looks uniform when new, but with polishing develops less regular, more antique look. There's some variation between pairs - some have a black strap below the pull-tag at the back; others just have a black tongue. Please let us know if you have a preference when ordering. These vegetarian shoes and boots are made with an expensive stitching process that fixes a ridge on the sole - called a welt - to the side of the shoe. This allows a complex sole design - in this case the Tredair sole made of up-market, crack-resistant plastic, a slice of foam, and a combination of insole board and felt which moulds to the shape of your feet over time. Most soles that claim to contain air will either contain a bit of carpet under-felt, which is good at moulding round your foot-shape, or a springy chamber with less moulding ability. The Tredair sole does both, as well as resisting cracks and bending easily. One customer writes "they feel very comfortable it will be a shame to go out in them - I think I'll use them inside and go out in my slippers!" You may not have heard of Tredair because of a historical accident. Until the early 80's, there was a brand of shoe that any good factory could make, as long as they paid for permission from Dr Martens family solicitors and met the quality standard - using a cushion sole, a sewn tag and bright yellow string sewing to emphasise the way that the shoes were made. A shared brand turned-out to be a very efficient way of structuring an industry - DMs were as ubiquitous as Cheddar Cheese, air force flight jackets or Champagne, and hardly needed any advertising. The competing factories provided a far better quality of seam-sewing than any brand-name boots could match for the price. Sewing things together in small batches with different designs and sizes is tricky. Factories have an idea of the number of operations they can do - often 100 - and the number involved in each batch which is often less in the factory but more in administration. When money isn't spent on brand advertising but is spent on getting through the dozens of operations instead, a wide range of shoes can be made and they get to reflect the times. 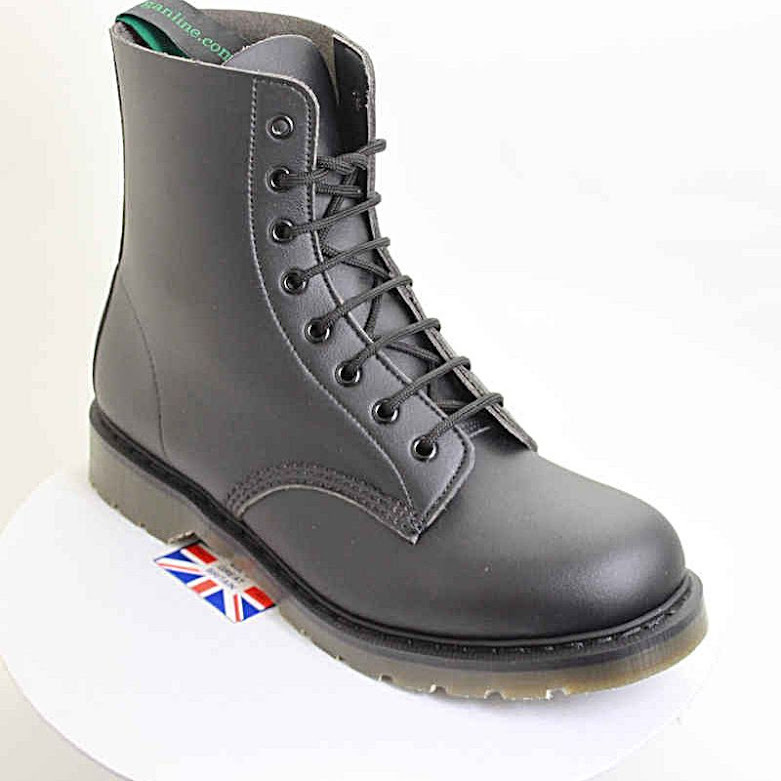 Another reason for DMs success was a new Health & Safety act after the second war, introduced when boot companies were re-structuring for the civilian market, allowed again to compete with each other and to make their own designs. The act allows employers to be fined or loose a case in court if they don't check-up on safety standards such as the new toe-cap boots that had just been introduced, and they appreciated the yellow sewing & pull tag that made it easier to check that their staff were equipped. To make the law easier to follow, a tax concession was introduced. Several mail-order companies began selling at wholesale prices to employers and anyone else who could pay for a minimum order - very much like office stationary catalogues - and very different to other wholesalers at the time which would only sell to one shop in each high street and tried to control the prices. Some manual labourers were able to get DMs cheap or free from their employers, while other people could buy them from market stalls or the army-surplus shops that had sprung-up in most towns. Thirdly, ankle boots are comfortable. The first application for Maetens' soles was for people in Austria with elderly or damaged feet, and the first upper shape was the shape of an ankle boot because it laces easily and loosely to womens and mens feet. A few decades later, in the early 80s, the UK government's economic policy was arguably to close most of manufacturing industry, or that was the effect, with 25% of UK manufacturing closing in one government's term of office. Successor governments and their Bank of England's monetary policy committee kept the same system in place until 2009. You can see it explained on the bottom part of this flow diagram. The largest factory making DMs survived by buying the brand and controlling all production itself. This also allowed quicker delivery times (which had never been a strength) and with a little more marketing DMs went mainstream, selling to mainstream shops rather than army surplus merchants. Where a few factories had experimented with bizarre variations like batches of mirror-finish boots or painted-on spider patterns, the new brand owners hired designers to tweak and change the finer points of the design and increase the range, moving away from the standard army-cut top and 1970s-shape sole. Over the past few years they saw dropping sales Younger people had forgotten why DMs had ever been a counter-cultural icon: they were no longer so ridiculously cheap or free, they had lost their association with muscle & toe caps, nobody thought about or worked in British industry any more, and the boots lacked the relaxed look that the e-generation liked. Footwear had become a style industry, with most trainer firms getting their stuff made in Chinese sweatshops, selling expensively in Europe and the US, and spending a big mark-up on advertising to promote falsely relaxed, liberal associations to their brands. One or two of the ex-factories and factories are still making cushion-sole derby boots with a Goodyear-welted seam, passing business between each other. They are not making many, because nobody has heard of them, and people assume that they are making a cheap imitation of the original product In the case of Tredair, we think they are making a better imitation. It has a better sole and a frankly better-looking seam And why should there be only one brand for cushion soles? Uppers are very well cut on these boots to avoid waste. Far-Eastern suppliers often maximise the complexity of a product to show how cheap their labour is. These simple shoes use at least a square foot or tenth of a square meter while ankle boots use 1.2-1.5 square feet @ £44.40 a square meter plus £10 delivery. The outer sole is another thick chunky component costing £3+VAT a pair with a £10 set-up cost per size for small orders. Add the small parts like 40p for pull-tags or a pound or so for the box, something for the three other layers of sole and you get up towards £25 on parts assuming they are all used. Some people like to store surplus material. Soles from White and Co lasted for 8 years after production transferred. Other producers try to get exactly what they need and no more to make each order, which can add to set-up costs. Buying small batches from UK manufacturers is likely to cost in delay, delivery charges, lack of discount, set-up fees, and prompt payment, but may be little more expensive than buying without thought from an importer who covers-up all these costs or who sells something just in time from a warehouse. There are 1-200 operations in making a pair of these boots, which take a lot of fiddling-about with materials & machines to get right. Working in a factory that makes small orders is tricky, because you have to co-ordinate with colleagues to do most of the different Jobs - shoe trade at different times. Usually the factory is in a cluster of traders who sometimes exchange small amounts of material without courier costs if you pick-up or collect stuff on the way to work. A trickier job is using a hot knife to seal the welt to the sole after the welt has been sewn-on, then using heat again to sculpt the out-sole and welt to a single smooth surface. Every pair of boots includes the cost of PAYE, National Insurance, business rates, business rubbish collection, fuel duty & the costs of following UK environmental & employment laws.Wages are under pressure in manufacturing but no worse than Jobs - shoe trade like hostel work, outreach and supported housing that I used to do because the work is so skilled that few people do it. Factory work is more like hostel work in lack of views from a window, personal desk space and hob knobs than office work, but does have the satisfaction of doing something that everyone can see if you have done it well or badly, rather than judge on a dress code or whether you sound good in team meetings. There are pundits who say you can't tell if factories are good or bad just by finding out what country they are in. These pundits and their organisations such as Ethical Fashion Forum are set-up by importers from China, staffed by consultants looking for work & interns who between them show little interest in the welfare state that UK manufacturing supports - either as claimants or taxpayers. One of their web pages warns against buying UK products for ethical reasons. "The company in India manufacturing the T-shirts, polo shirts and sweatshirts have social responsibilities to all employees and is committed to overall employee welfare and providing a healthy working environment. It meets ethical standards required for the manufacture of Fairtrade garments. The factory site includes a housing colony for over 1800 workers with parks, a dispensary and four bed hospital, plus a school offering subsidised education." If you would like to go further and promote hospitals with more than "4 beds", universal rather than "subsidised" education and services to people who have been evicted or left the "housing colony for 1800 workers" then look no further than the UK. These have been rigged to reduce inflation in the UK from about 1979-2009 and are still rigged in the opposite direction in China, where the currency is made cheaper by out-flows of money controlled by the elite who like to buy assets round the world or build-up Swiss bank accounts. PR, executive salaries, executive salary committee salaries, PA to the CEO at HQ, national advertising, distribution warehouses, stock held in every high street and not just online, corporate events, government lobbying, a tower block in the most expensive city of London that looks like the corporate logo from above.. Next to no money is spent on the essentials in these categories and none on the non-essentials. That's partly why people believe the pundits who promote "ethical" manufacturing in China; UK manufacturers aren't throwing money at PR and leave customers to draw their own conclusions from the facts available, and support local manufacturing. People all over the world support local manufacturing. They benefit the world economy by taking an interest in the products of wherever they happen to be living, rather than the advertised brands or the brands with ethics wash and green wash credentials. With luck, you will do the same whatever country you are in.